When papers and books are wet, freeze drying via sublimation is the best and fastest way to salvage them. Papers and books can be wet from a variety of circumstances, such as broken water pipes, a roof torn off during a tornado, area wide flooding, etc. Often times many of these papers and books may become submerged under water, contaminated with a variety of debris and sustain substantial damage. The dilemma for the owner of these documents and books is what to do and who to turn to. In today’s environment preserving documents for business and historical purposes is not only a need, it is often the law. Retention of records is required in many cases for decades. Additionally, some documents may have historical value to an organization and they want to preserve these permanently. Often, these materials are highly secure and confidential. Documents and books that have become wet, moldy or have debris such as soot can be recovered while in a secure environment. By freezing paper that has become wet, the mechanical disintegration of it will end, ink will stop dissolving and the potential for mold and fungus growth ceases. Once frozen, paper can stay in that state indefinitely and transport via any refrigerated means. Why Should You Choose Freeze Drying? Documents exposed to water will continue to experience further damage as the water equalizes or wicks into the paper. The Library of Congress and the National Archives & Records Administration both recommend vacuum freeze drying by sublimation as the preferred method for removing water from paper. Modern large-scale freeze-drying chambers actually cost less than desiccant or air drying papers/books. During the freeze-drying process, the quality of paper is maintained. By comparison, papers dried by air or dehumidification will swell up to 25%, wrinkle (cockle) and lose tensile strength. Water exists in three phases: liquid, solid and gas. It is the liquid phase of water that is most damaging to paper and any media printed on it. The cross-scission and cross-fusion of paper are gradually destroyed by water, and the tiny fibers of the paper separate, and in turn, these fibers no longer serve as an adhesive. Most writing pen inks are water soluble and begin to run or dissolve. And finally, mold now has an optimal environment for growth. Because of this, simply air drying water soaked paper is not practical. By allowing paper and books to start drying instead of freezing, additional damage is occurring to the documents. The escaping water molecules separate and break the paper fibers while rendering the lignin useless. Paper generally swells about 25% greater in volume and 30% or greater in reduced strength, causing it to tear easily. When wet books start to air dry, the same issues mentioned above occur, but to a greater degree. The spines of the books are generally stitched. This stitching will minimize the dimensional change of the spine but all the energy of moisture evaporation into the air will cause massive swelling on the fore-edge of the book. For this reason, it is important to remove all books prior to any attempts in dehumidifying the area. If necessary, a plastic vapor barrier can be constructed to section off the area. In order to minimize damage, freezing books in a timely manner are very important to remember. Drying frozen, water-soaked paper via sublimation (or freeze drying) is slower than evaporation directly from the liquid phase. However, sublimation causes the least amount of damage to the paper and content. The drying rate using sublimation can be controlled by manipulating process parameters, minimally impacting the time difference. Due to the damage produced by air drying and desiccant drying wet paper and books, it is clear that drying via sublimation is the best solution. What Is Freeze Drying via Sublimation? The technical aspects of drying via sublimation (or freeze drying) can be complex, but the basic principles of the process have been widely understood and accepted for generations. Sublimation is a phase change which requires latent (not apparent) heat energy. This energy leaves the solid ice with the vapor and, by the process known as evaporative cooling, the temperature of the ice tends to get colder. Therefore, it is necessary to have heat from outside the system (in our case, electrically heated shelves). Now, if there is more heat energy available than that required for optimum sublimation, the temperature of the ice will rise and its vapor pressure will too, thus increasing the rate of sublimation. It is important to know that, for certain historic archival documents the heated shelves are optional; the process will simply take slightly longer. Depending on the type and age of the material, some archivists recommend removal of heated shelves for preservation purposes. In order to closely monitor the temperature of the paper, BMS CAT places temperature sensors in multiple boxes throughout each chamber. Low pressure and a surplus of heat (energy) are essential during the freeze drying process. However, when the pressure reaches 0.100 Torr (proxy) the process becomes adiabatic (without loss or gain of heat). At this point, the process is truly optimized because all of the electric heat added works to raise the temperature of the ice versus supporting sublimation. The condenser (freeze trap) assists the vacuum pump in lowering chamber pressure. When the sublimed vapor clings to the condenser surface, it changes phase and reverts back to a solid, giving up its latent heat as sensible (apparent) heat, thus the need for refrigeration. As the ambient condenser pressure is lowered, vapor from within the chamber tends to fill this region and equalize the pressure of the total chamber/condenser volume (vapor laws). The coil must be sized to condense vapor at the optimum sublimation rate. This can be accomplished via large surface area or very low surface temperature. 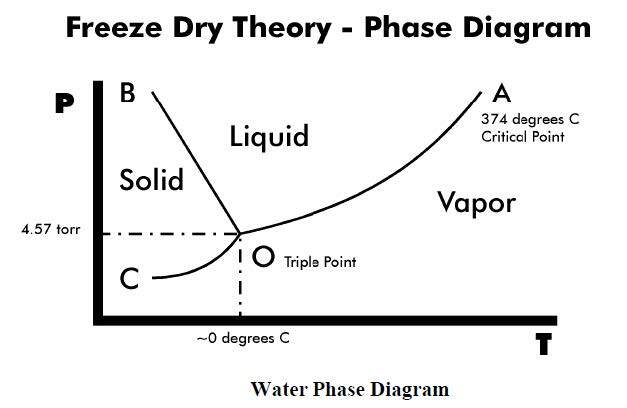 The graph above is the phase diagram for water. For any combination of pressure (vertical axis) and temperature (horizontal axis), you can tell whether water is solid, liquid or gas. Normal atmospheric pressure at sea level is 760 Torr. If the pressure is below 4.57 Torr (point O), water can exist in only two states – solid and vapor (depending on the temperature). Point O is called the triple point of water because it is the only temperature and pressure where water can exist in all three states: solid, liquid and vapor. Remember, all the damage to paper is done during the liquid phase of water. By keeping the pressure below 4.57, we prevent further damage while allowing the ice to sublimate (go directly to vapor). The process of freeze drying consists of placing the frozen documents into the freeze dry chamber, reducing the pressure in the chamber to about 2.3 Torr and adding heat to warm the documents, causing sublimation, the conversion of ice to vapor. The vapor is condensed on refrigerated coils in the cold trap attached to the chamber. Periodically, the cold trap is isolated from the chamber and the refrigeration cycle is reversed to heat the coils. Next, the cold trap is opened to atmospheric pressure, and the ice is melted and removed as the liquid water runs into a container. There are several cold traps operating “push-pull” – while one trap is in defrost; the other is still connected and removing water. How Do You Know If Documents are Wet? If paper items, such as books and manuscripts, have been exposed to excessive humidity, are near a water intrusion, under a sprinkler discharge or partially submerged in water, they should be inspected for moisture content with a moisture meter. The moisture meter will determine the amount of moisture present in the material. Simply visually inspecting the items or touching them will not tell the whole story. Moisture can be deceiving, you cannot always feel or see it. An archivist’s electronic moisture measurement meter will give you the full picture. 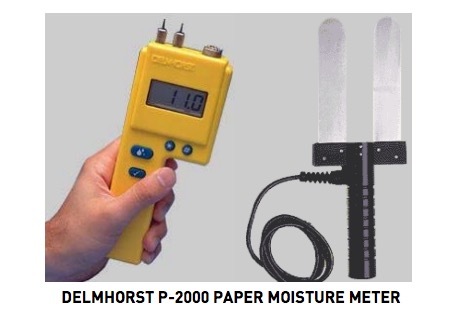 The meter will read from 4.3% to 18% (saturation) moisture range on paper. It is important to check the owner’s manual for instructions on how to calibrate the device prior to use and calibrate before each use. Moisture Content is considered within the acceptable range when the measurement is < 7% MC (Moisture Content). Many offices may have documents that are in the 5% to 7% MC range. 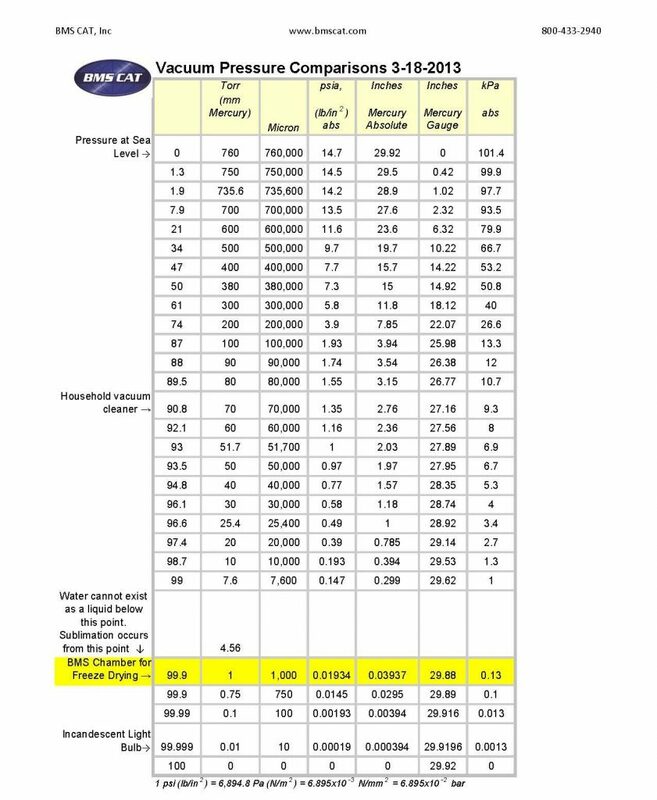 Moisture Content is considered higher than desired when the range is >7% MC but < 11% MC. Document moisture content is then considered “humid-damp”. It is recommended that action reduces the moisture content to less than 7% be taken within 48-72 hours. During this time frame, it is acceptable to try moisture removal on site with blocking or air movement when dealing with small batches of documents. If you are unable to remove moisture within 72 hours, schedule documents for freeze drying. Moisture Content is considered “unacceptable” when the moisture content is greater than 11% MC. At this point, the documents are considered “wet” and should be freeze dried via sublimation immediately. Your first step is to freeze the documents to mitigate any further damage until the documents can be shipped to the freeze drying chambers. Freezing: The most effective method way to stabilize water-damaged archival and library materials is freezing at low temperatures as quickly as possible. This is the most generally accepted method by conservators. The recommended freezing level should be around -30 °C (-20 °F). Frozen materials should remain in cold storage until freeze drying can occur. BMS CAT is able to provide refrigerated trailers at the loss site. These trailers are capable of achieving a -20 °F temperature. This will allow teams inventorying to process items then immediately place pallets of wet books or documents into the refrigerated trailer, thus mitigating the damage. Once a trailer is full it can be shipped with the appropriate security levels in place to our secure freeze drying facility. 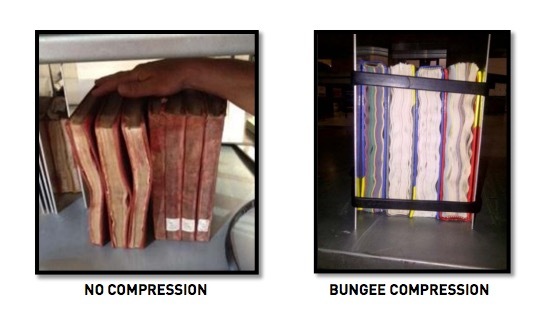 Compression: It is important to note that books dried without mechanical compression will distort and cockle. Several companies will attempt to solve this issue with rubber bungee cords with minimal success. BMS CAT has developed a proprietary process of “Self-Compensating Mechanical Compression” book reforming. A snapshot of the process is illustrated below. Freezing Documents Halts Mold: Mold requires three things to thrive: moisture, food, and temperature. By freezing documents, the temperature required for mold to thrive is lowered to a point where it cannot survive. While mold spores are not destroyed by freezing, they remain dormant until a more favorable environment is available. Freezing will stop the infection of mold thus harmful damage to the documents ceases. Freezing Stabilizes Soluble Inks and Dyes: Freezing has the additional advantage of stabilizing inks, dyes, dyestuffs and colorants used for manuscripts, maps, sketches and drawings that are soluble in water. Later, when freeze-drying takes place, migration or feathering of inks or dyes can be restrained since the liquid stage is by-passed. 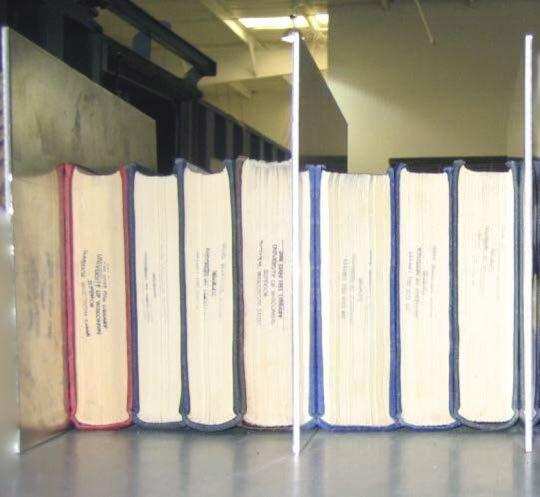 Freezing Prevents Adhesion of Pages: Books and periodicals are generally printed on stock that uses a coating pigment with a binder of casein and starch, both of which are highly water-soluble. If coated stock is permitted to dry, it will turn the book into a clay-like brick at which point restoration is impossible. The only practical method to salvage these items, especially when large quantities are involved, is freezing while wet then freeze drying. Freezing Gives You Time To Assess: By freezing water-damaged documents, they are stabilized as long as they remain frozen. Disasters can be stressful and confusing. When stabilizing documents through freezing, there is time to assess the damage. Decision makers can determine which documents can be discarded, replaced or copied. It allows time to determine what repairs or restoration is required and how much time it will take to recover damaged storage areas. Freeze Drying Uses Fewer Chemicals & Produces Fewer Odors: The process uses fewer chemicals, thus producing limited odors. The vacuum chambers cause VOC’s (Volatile Organic Compounds) to “flash off”, boil or vaporize because the pressure in the chamber is lower than the boiling point of the VOC’s. Additionally, many chemical contaminants escape with the gasses released during the process. As a result, the documents will smell better and have very few (if any) remaining contaminants. If any contaminants do remain, they can be removed during the cleaning process. Following a plane crash in the Hudson River, many paper documents were submerged in water overtaken by pungent jet fuel. Our freeze drying chambers were able to remove most of the odor from the jet fuel. Freeze Drying is Safe for Documents and Books: “In studies conducted by the Research and Testing Office of the Library of Congress, there was NO evidence found that freeze-drying causes damage of cellulosic and proteinaceous materials (5).” Source: Vacuum freeze-drying, a method used to salvage water-damaged archival and library materials. A UNESCO (United Nations Educational, Scientific, and Cultural Organization); Study 1987. Freeze Drying Produces a Cleaner Document: The gasses released during the sublimation process deposit loose matter to the surface of the papers. This facilitates a better cleaning to the papers by removing silt, loose mold spores, and other contaminants. Freeze Drying Is a Safe and Secure Way To Dry Documents: According to the National Archives (NARA), “Records can dry in their original containers reducing the risk for disruption of original order.” This allows us to have a secure process, keeping clients documents segregated from other client’s documents. According to the National Archives (NARA), “Records must be removed from their containers, spread on shelves to dry in warm dehumidified air, and periodically rotated to expose wet paper surfaces.” As you can imagine, a great deal of space must be used to spread the paper out individually. The risk of this process is that documents can be knocked off of shelves and intermixed with other client’s documents. Because paper is spread throughout a facility, there is a greater risk of retrieving the wrong file or intermixing files. If there is any advance notice of potential damage, all possible protective measures should be taken such as covering items with plastic, raising furniture and protecting electronics. Additionally, consider permanent storage of certain valuable items (rare books, historical newspapers or long term archival documents) in buffered, acid-free storage boxes. It is important to have a plan in place for a disaster. It is highly recommended that you pre-contract with a restoration company before a loss occurs. This gets any administrative “red tape” out of the way, expedites response times and allows you to carefully pre-qualify the service for your exact needs. BMS CAT offers a Response Service Agreement at no cost.